How to interface and use Matrixx Mini switch modules : Manitou Systems Inc. This page includes ideas and concepts on how to install the Matrixx Mini RF / DC switch module into a typical plasma processing system. Each application, installation and, hardware set is different so please use this information as a guideline and contact the Manitou Systems “RF Witchdoctor” with your comments and questions. The schematic below is typical of the need to switch 1 magnetron sputter cathode between DC and RF plasma power generators. The Matrixx Mini can be mounted in two locations; either directly at the impedance matching network’s output or directly on the magnetron cathode. Please take note of the required coaxial cables and their suggested maximum lengths. The rule of thumb is to keep all RF power carrying cables as short as possible. The DC power carrying cables are not as sensitive to length so they can be a lot longer. The path from the matching network output > the plasma is critical so please keep this in mind when designing your system. The Manitou Systems Witchdoctor suggests mounting the Matrixx switch module directly to the matching network’s output connector using a coaxial adapter. See an image of the Matrixx Mini switch to the right. The next step is to determine the configuration of the output cables (Matrixx > sputtering source). The Witchdoctor suggests keeping these cables as short as possible. We understand that our Matrixx switches are used as retrofits to existing systems so replacing cables or keeping them short (as suggested) may not be an option. The Witchdoctor reminds us that in his 30 years of field experience, he has seen many examples of “less than optimal” installations that will still function – although with limitations, inefficiencies and/or early life failures. These installations include ultra long cable lengths, smaller than desired coax cable types, too many coaxial adapters and, the use of TEE connectors to feed multiple power generators to a single plasma load. All of these infractions tend to result in a “rats nest” of cables, power losses to the plasma, lower than expected deposition rates, overheating cables and, connector failures. 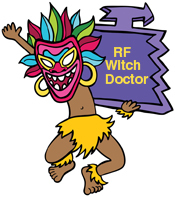 Contact the Witchdoctor if you would like to ask a question. The Matrixx 24VDC control connection is a D-Sub 15 connector located on the side of the enclosure. The Witchdoctor suggests that a shielded cable be used to connect to the plasma system controller or other source of switched DC control power. When the Matrixx Mini is purchased with it’s complementary control panel, we supply a properly shielded cable.